WhatsApp, the most widely used instant messenger in India, has added a much-awaited feature to the latest version of the app – support for use of WhatsApp on a PC. 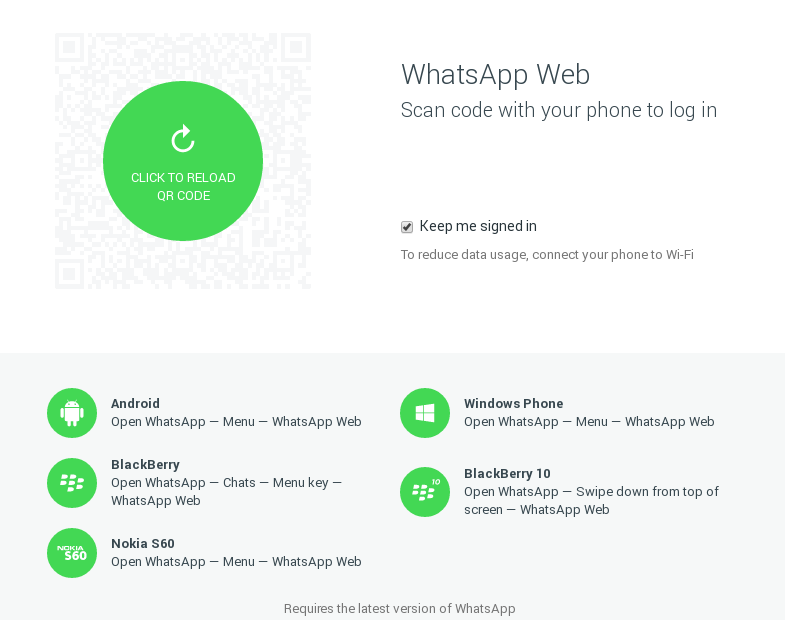 With the latest version that is available in the Google Play store, users can simply open the main menu, touch ‘WhatsApp Web’, hold the phone in front of a webpage showing web.whatsapp.com and connect. Once the phone account and the web account are connected like this, both function as one unit. Whatever message appears on the mobile version will also turn up on the web or PC version. “Today, for the first time, millions of you will have the ability to use WhatsApp on your web browser. Our web client is simply an extension of your phone: the web browser mirrors conversations and messages from your mobile device — this means all of your messages still live on your phone,” WhatsApp said in an official announcement. Here are the instructions on how to use WhatsApp on PC or web. 1) Open https://web.whatsapp.com in your Google Chrome browser. 2) You will see a QR code (a black square). Click on the main menu of WhatsApp, click on WhatsApp web, scan the code inside of WhatsApp, and you’re ready to go. Remember that your phone needs to stay connected to the internet for our web client to work. WhatsApp web does not work with the iPhone (iOS) version of WhatsApp. “Unfortunately for now, we will not be able to provide web client to our iOS users due to Apple platform limitations,” it said. This is likely to further increase the popularity of WhatsApp in India. An estimated hundred million users take advantage of WhatsApp to keep in touch with their friends and relatives in India. WhatsApp has been resisting the idea of allowing users to log in from their PCs so far to prevent duplication of accounts. On a PC, it is very difficult to ensure uniqueness of accounts. In other words, the same user can open multiple accounts. Another related reason is that WhatsApp uses a person’s mobile number as a unique identifier. If you know someone’s mobile number, WhatsApp lets you message that person, whether or not that person is your ‘friend’ or not. This concept is nearly impossible to implement on the web. As a result, people have to either be ‘friends’ for messaging each other, or live with a large amount of spam in their inboxes. The WhatsApp web solution marries the unique identity of the phone with the ease of use of the PC by tying both accounts together. You will still need a phone to create and operate a WhatsApp account, though the process of replying to messages has become much easier now.